A team of researchers led by Michele Fumagalli from the Extragalactic Astronomy Group and the Institute for Computational Cosmology at Durham Univ., were among the first to use ESO’s Multi Unit Spectroscopic Explorer (MUSE) instrument on the VLT. Observing ESO 137-001 — a spiral galaxy 200 million light-years away in the southern constellation of Triangulum Australe (The Southern Triangle) — they were able to get the best view so far of exactly what is happening to the galaxy as it hurtles into the Norma Cluster. MUSE gives astronomers not just a picture, but provides a spectrum — or a band of colors — for each pixel in the frame. With this instrument researchers collect about 90 000 spectra every time they look at an object, and thereby record a staggeringly detailed map of the motions and other properties of the observed objects. ESO 137-001 is being robbed of its raw materials by a process called ram-pressure stripping, which happens when an object moves at high speed through a liquid or gas. 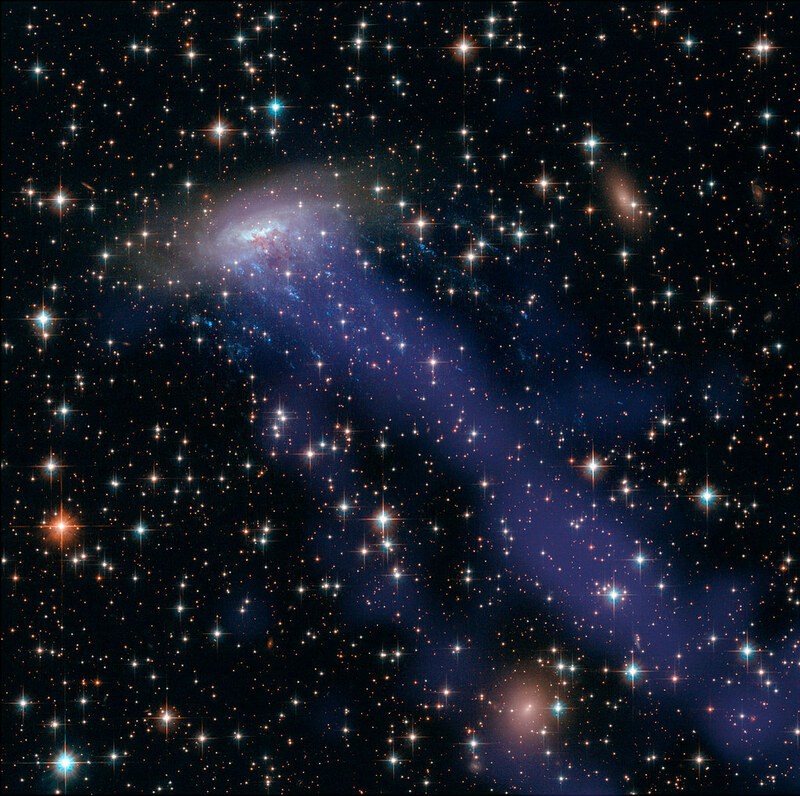 The gas is part of the vast cloud of very thin hot gas that is enveloping the galaxy cluster into which ESO 137-001 is falling at several million kilometers per hour. The galaxy is being stripped of most of its gas-the fuel needed to make the next generations of young blue stars. ESO 137-001 is in the midst of this galactic makeover, and is being transformed from a blue gas-rich galaxy to a gas-poor red one. The findings reveal a bit more about the evolution of galaxies. Scientists estimate that eventually, all of the galactic gas will be swept away into bright streaks behind the galaxy, forming magnificent tails. Result Of the Study: http://goo.gl/G7h8BU.